We have already studied transverse pulses and waves. In this chapter we look at another type of wave called a longitudinal wave. In transverse waves, the motion of the particles in the medium was perpendicular to the direction of the wave. In longitudinal waves, the particles in the medium move parallel (in the same direction as) to the motion of the wave. Examples of transverse waves (discussed in the previous chapter) are water waves. An example of a longitudinal wave is a sound wave. A longitudinal wave is a wave where the particles in the medium move parallel to the direction of propagation of the wave. When we studied transverse waves we looked at two different motions: the motion of the particles of the medium and the motion of the wave itself. We will do the same for longitudinal waves. The question is how do we construct such a wave? A longitudinal wave is seen best in a slinky spring. Do the following investigation to find out more about longitudinal waves. 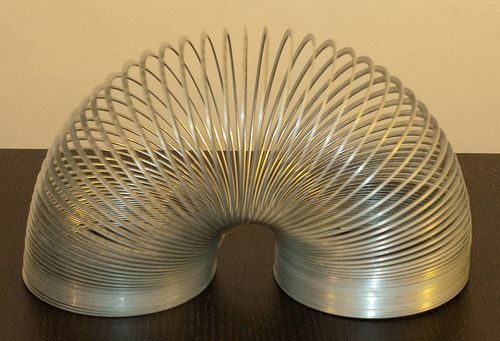 Take a slinky spring and lay it on a table. Hold one end and pull the free end of the spring and flick it back and forth once in the direction of the spring. Observe what happens. In which direction does the disturbance move? Tie a ribbon to the middle of the spring. Watch carefully what happens to the ribbon when the end of the spring is flicked. Describe the motion of the ribbon. Flick the spring back and forth continuously to set up a train of pulses, a longitudinal wave. From the investigation you will have noticed that the disturbance moves parallel to the direction in which the spring was pulled. The ribbon in the investigation represents one particle in the medium. The particles in the medium move in the same direction as the wave. As in the case of transverse waves the following properties can be defined for longitudinal waves: wavelength, amplitude, period, frequency and wave speed.